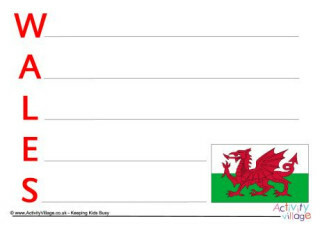 Here we have a very eclectic collection of Wales worksheets for if you are looking for something a bit different. Enjoy exploring! Learn about the history of Caernarfon Castle and test children's ability to make sense of pieces of text with this simple cloze worksheet. We have left space for a headline so you can choose your own story on this newspaper writing prompt. Perhaps you might write about the building of the castle or the birth of Edward II or perhaps you might like to write about a visit or event that you attended. Children need to think about what information they need to include and the audience and purpose of their writing to complete this Caernarfon Castle tourist information leaflet. It's important to follow recipes carefully to get the best results, and this recipe comprehension test is a great way for the kids to practise reading and understanding ingredients, measurements and instructions. Can they read the Welsh Cakes recipe then answer the questions at the end? Every farm theme needs sheep, and here's a sheep notebooking page that you can use to write about them! Choose from two versions, one with space for a picture and one with simple lines throughout. Print this cute jigsaw onto card and then cut into 10 pieces, leaving the letters attached to the lower pieces of the picture. Now the children can put the jigsaw back together using the letters as a guide. It's a fun way to learn to spell the word! Find out some simple facts about the sheep in order to fill in our fun worksheet. Choose from colour or black and white to download below. Read all about Tintern Abbey in Wales and fill in the missing words. Cloze activities are a good way of practising reading and understanding. Use our Titern Abbey newspaper writing prompt to tell any story you chose; the Abbey's foundation, the rebuilding, the closure during the Reformation or a report of an event held their today. Practise writing for differnet purposes by writing a tourist leaflet for Tintern Abbey in Wales. Print and fold along the dotted lines to make a 3 panel leaflet. Follow the instructions on our fun football worksheet to colour in Wales kit for Euroe 2016, both home and away. Use this notebooking page to collect facts about Wales! We have two versions to choose from. Version 1 includes space for a picture or map. The Royal Badge of Wales is very intricate and quite pretty! Can the kids find out about the badge, including when it was adopted and the meaning of the different parts? This fun printable allows the children to come up with a design for a professional-looking 3-fold tourist leaflet all about Wales. There are lots of fantastic reasons to visit Wales! Can the children include some of them in a Travel Brochure, and draw a picture to go along with the text?